 » First Class » You&apos;re currently reading "First Class – Ms McManus"
During the month of November, we spent a lot of time learning about space. 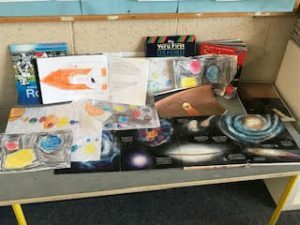 The whole class showed such a big interest in space and had such amazing knowledge on the topic, that we even created a space table! Every morning, we would spend a few minutes discussing any new objects or creations that were brought in and placed on the table. We loved to spend any free time we had picking up some new knowledge from the amazing things people brought in. 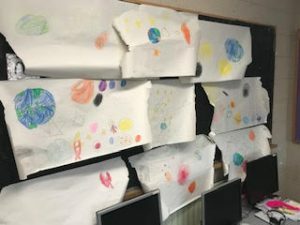 Once we had learnt a little more about the planets, we created these space pictures! Can you believe we put black paint over our beautiful colouring? It was a little scary but we think it paid off! 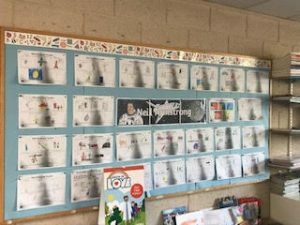 News from Ms. Woods’s Junior Infants	“You’re Under Arrest”…..in Ms. Olson’s Senior Infants! Welcome to the blog of St. Anne's National School, Shankill. Our blog posts are composed by our student media team with support and guidance from our teachers. We hope you enjoy exploring our blog and are inspired by all that we do in our school! 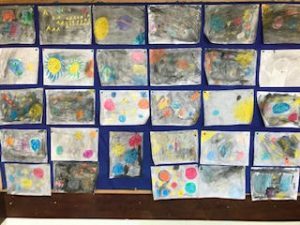 February News from Ms. Olson’s Class! Hard at Work in Ms. Woods’ Class! The Reason Why School Is A Safe Place to Be! Oh I Really Love Bees! Interview with Steve Davis, GAA Ballskills Coach in St Anne’s. St. Anne's National School 2017. All Rights Reserved.